FALL RIVER, MA--(Marketwired - Dec 10, 2013) - Rex-Cut Abrasives has introduced a full line of Type 27 cotton-fiber abrasive grinding and blending wheels that provide smooth controlled grinding action, run cool, and are non-loading on aluminum. 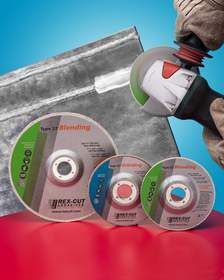 Constantly revealing fresh abrasives as they work, Rex-Cut® Type 27 Cotton Fiber Grinding Wheels for aluminum incorporate a GFX synthetic latex bond and come in 36- and 54-grit versions. Sizes offered include 4", 4-1/4", 5", 7", and 9" dia., in 1/8", 3/16", and 1/4" thicknesses; available with or without 5/8-11 throw away adapters. Rex-Cut Abrasives is the oldest manufacturer of cotton fiber abrasive grinding and finishing products in the world. Since the early 1920s, they have been manufacturing a non-woven cotton fabric that is impregnated with abrasive grit and then pressed and formed into various shapes that constantly reveal fresh abrasives as they work and typically reduce finishing steps in all types of industrial and architectural metal fabrication applications. Rex-Cut(R) Type 27 Cotton Fiber Grinding Wheels are ideal for blending and finishing aluminum in one-step. They are non-loading and eliminate the need for waxes and lubricants.